The Court of Arbitration for Sport (CAS) provides international sport with an organisation dedicated to the settlement of sporting disputes swiftly and inexpensively. Its decisions are equivalent to judgments passed by state courts. Since its inception in 1984, it has time and time again earned the recognition and respect of all stakeholders in the sporting world. This third volume of major CAS decisions covers the years 2001, 2002 and 2003, including those decisions issued during the Olympic Games in Salt Lake City. In line with the first two compilations (which cover awards issued from 1986 to 2000), it continues to prepare the ground for a specialised case law, a real lex sportiva in development. It also contains all essential texts regarding the organisation and activities of CAS. Like the earlier volumes (the first of which won the René Cassin Prize, awarded every three years by the Académie Française des Sciences Morales et Politiques, in 1999), most decisions in Volume III are presented in both English and French. Matthieu Reeb is the Secretary General of the CAS and responsible for the management of the court, supervising the arbitration procedures and organising the CAS ad hoc divisions established during the Olympic Games and Commonwealth Games. 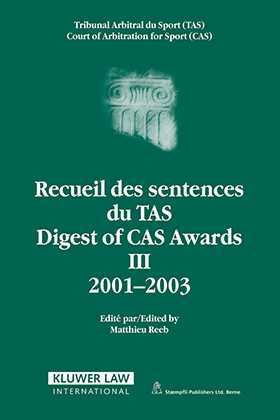 In addition to editing the CAS Digests, Matthieu Reeb is also the author of several articles related to the CAS and its case law. Earlier volumes of the Digest have found a wide readership. This update is sure to continue that interest, especially with its detailed references, invaluable to legal practitioners, to sports law and arbitration. Sports organisation officials also will discover here an incomparable source of legal information. Introduction, by the H.E. The Judge Kéba Mbaye, President of the ICAS/CAS.The Court of Arbitration for Sport: History and Operation, by Matthieu Reeb, CAS Secretary General. Presentation of CAS decisions. I. Awards rendered by the CAS as a sole-instance court (ordinary arbitration procedure). II. Awards rendered of appeal concerning doping cases. III. Awards rendered of appeal concerning cases different from those related to doping. IV. Awards rendered by the CAS as hoc Division: Olympic Winter Games in Salt Lake City (2002) and Commonwealth Games in Manchester (2002). V. Orders. VI. Judgment delivered by the Swiss Federal Tribunal in relation to CAS. VII. Code of Sports-related Arbitration (Edition 2004). VIII. CAS mediation Rules. IX. Arbitration Rules for the Olympic Games. X. Agreement related to the constitution of the ICAS. XI. Statistics. List of published decisions. Abbreviations. Index.